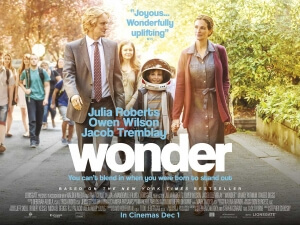 With Paddington 2 and now Wonder, Stephen Chbosky’s adaptation of the bestselling novel by R.J. Palacio, the message of family films seems to be that, in these dark and depressing times, you should always remember to be good and kind to others, and maybe in return they will be good and kind to you. On the one hand, it’s kind of ridiculous we have to be TOLD this when it should be a matter of common sense, but on the other hand we’ve gotten a couple of really sweet and lovable films out of it in the past short while, and although Wonder perhaps isn’t as all-around pleasing as Paddington 2 is, it still remains a winning and undeniably adorable family film with a strong, positive message to it. The film is primarily about young August “Auggie” Pullman (Jacob Tremblay), who when he was born had severe facial deformities that he required a large number of surgeries just to allow him to breathe normally, which has left his face looking far from what is considered normal. After years of being home-schooled by his mother (Julia Roberts) and entertained by his father (Owen Wilson), he is about to enter public school for the first time, where he at first faces overwhelming and unwanted attention from his fellow classmates, including a good number of the bullies, but soon makes some friends who help him come more out of his shell and into the hearts of those he comes across. As with his previous film The Perks of Being a Wallflower, Chbosky lets the emotional moments play out as exactly that: moments. Heartfelt conversations between characters will be had, with barely any sentimental music playing during them (only coming in when everything that needs to be said has been said), and they rely far more on the power of its actors and the simple but effective writing to draw an emotional reaction from you. More often than not it works, because the characters are wonderfully constructed and later deconstructed which allow you to really get to know them, and not have them appear to be just two-dimensional cut-outs. One of the cool things about this film is that we get to see various perspectives on the whole ordeal, like Auggie’s older sister Via (Izabela Vidovic) who’s having her own problems at high school as well as the burden of having a younger brother who takes up all her parents’ attention, Auggie’s school friend Jack (Suburbicon’s Noah Jupe) who at first feels like it’s a chore to befriend this new kid but later comes to greatly admire him, and even Via’s distant friend Miranda (Danielle Rose Russell) who we at first think is just the standard “close friend becomes popular so distances herself from main character” cliché but we later learn has her own little arc going on as well. These really help to humanise the characters and make them a bit more digestible than the same tired stock stuff we’ve seen plenty of other times, and they also add a genuine feeling of warmth to the movie which ensures you’re on board with this kid and his many associates’ respective journeys. The acting is solid from everyone, from esteemed players like Julia Roberts and Owen Wilson, to the younger supporting cast of relative newcomers, all of whom have Tremblay to guide them as the bright beacon in all of this. Even under heavy make-up, Tremblay makes good on the promise he first hinted at in Room (and yes, even The Book of Henry) and easily carries this film with his raw talent for emotional as well as legitimately funny scenes. He makes this kid incredibly easy to sympathise with, and you buy each one of his frustrations because coming from this remarkable young actor they feel so real. The message of the movie, though, is what earns it the most brownie points. It’s a simple one – just be good to one another – but it’s no less powerful, especially in times of hate and oppression where something like this is very much needed. Children can definitely take a lot away from this endearing message, and so can many of the adults in the audience, too; if we can just look past some of the glaring external flaws, we can see the goodness in everyone and rub some of that onto ourselves, and not necessarily fix the world but at the very least make it a bit nicer to live in. Again, it’s kind of a shame that people have to be reminded about this most basic of human traits, but even so at least we’ve now got a couple of pretty strong family films out of this one shared message. Though it perhaps doesn’t reach quite the heights of greatness as Paddington 2 does, Wonder still manages to be a charming, positive and much-needed family movie about just being good to other people, and experiencing the wonders of receiving kindness in return. Wonder is an irresistibly adorable family film with a touching, sweet message of positivity and kindness, which given the current climate of hateful rhetoric is greatly needed as much as Paddington 2 is right now.